Just purchased my 2016 2.0 A6 Sline Black Edition in Tornado Grey and picked it up last week. It had 9,000 miles on the clock in two years. However, I've just noticed that the rear of the car has been de-badged fully, and the sline badge has today fallen off at the drivers side. Also had an Adblue 1,500 miles notification yesterday. Is this normal so early? All I know about previous owner was that it was previously registered to a business. Just wondered if I'm worrying too much over small issues so early on? My worry is that its bean rear ended and the boot has been replaced, rather than an owner looking to de-badge. Adblue is about right at 9k. I was using about 10 litres to 7500 miles but I never brimmed it. It takes about 17 litres to fill from about 1000 miles warning but adblue comes in 10l so always had a bit left. So just ended up shoving 10l a time. Badges isn’t an issue unless it looks like a bad repair/paint job. Have a look at your options and see if it was a factory de-badge. If it was, nothing to worry about! Had a look at the options through myAudi and there's nothing mentioning a factory de-badge. All I can see is Sline logo exterior and Black Styling Pack and a few others. I'll see what the dealer say. Not that I don't like the de-badge look. It's just the worry that there's something underlying. It may not be that relevant but could you post a picture of the rear quarter panel profile to where it meets the bumper? I’ve seen three tornado grey audis and the bumpers always look a shade darker. Rebadged looks great. I was thinking of doing mine. 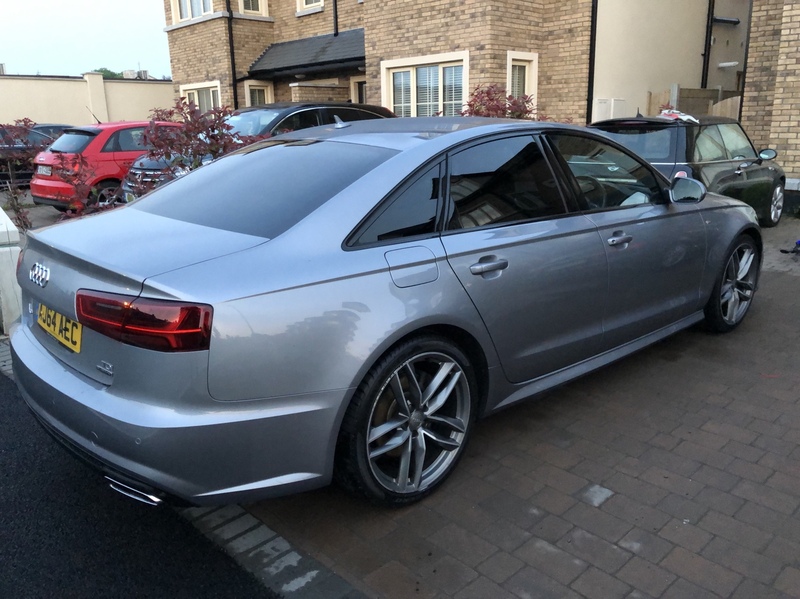 It’s hard to see from that photo but including my car I’ve seen three A6 in tornado grey where there is a small colour difference to the front and rear bumpers. Just in case you were worried about a rear end repair. In my opinion it’s an issue on all C7 in tornado grey. I do love the clean look with it being debadged. I was just a little suspicious, but it's going to the dealer on Monday for a look. I never even noticed the different colour bumper, I'll take a closer look now. Don’t let it bother you at it seems reasonably common. I originally wanted Daytona grey but now after three months of ownership I think Tornado is better. de-badging is pretty standard on any make/model for the lower spec cars in a range, so I wouldn't let that bother you. Even if it was a company car - it's such an easy mod, that any enthusiast might have done it. Once it's parked up, it looks as smart as any V6 and it's only the small brakes that are the give-away, but most people wouldn't notice that! A6 (C7) Avant 3.0TFSI @ 375bhp, DSG, rain and light sensor pack, LED headlight pack, MMI touch, SDS high, AMI, 360deg sensors + auto-park, Stock 18" rims w/ Dunlop SP Winter Sports / Pirelli P Zero's. Classic sleeper. Let them know what it is when you unleash the hounds. I’ve got 272 3.0 tdi but when a Ferrari F12 went by me like I was stopped this summer I decided a bitdi with proper remap will be required for next summers trip thru France! I got it stopped without too much drama and then it dawned on me what a nightmare doing a further 500 miles on a space saver would be! 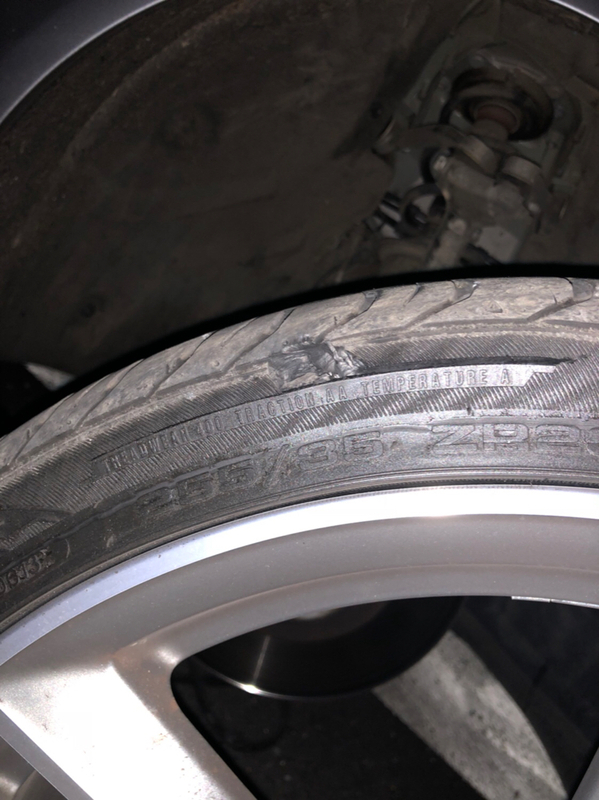 Lesson learned avoid cheap ‘verentti’ tyres that are only €60 cheaper but could kill you. I got it replaced with a new Pirelli Zero when I docked in Portsmouth. Made it to Fishguard in plenty of time. Bet that gave you a bit of a scare at that speed. Glad you managed to stop it with no dramas. Should you change both tyres on the axle at the same time with an AWD? Thought I’d read somewhere that it’s not good for it to have different tread/grip levels on each side. Could be wrong though, often am. On the torsion based Quattro I was always told the difference between the 2 tyre on the same axle should be less than 2mm and less than 3mm between front and back. My last A6 wore similar rate all round. Less than half mm between tyres. That reminds me to change the other front tyre. I’m kinda stuck with the Pirelli Zeros. Does anyone know why they are R20 and not ZR 20? I believe the Z represents the speed rating of the tire. Z = Max speed in excess of 149mph. You probably have a speed rating letter somewhere else on the sidewall. I think (?) the speed rating is an EU requirement on all tires sold within EU, including UK.